What is “Bike Share (Community Cycle)”? Some of the materials (ex. Website, the user’s guide, e-mail) might be still offered only in Japanese, and several staffs only speak Japanese. We apologize in advance for any inconvenience caused by insufficient foreign language service. Payment can be done by credit card Or you can also purchase by transportation IC card on Kiosk. *You can also buy a 1/1.5-day pass at counter . You can easily register for membership by PC/Mobile. Upon registering for memberships, you can use variety of useful functions with reasonable price. You can purchase on Kiosk! 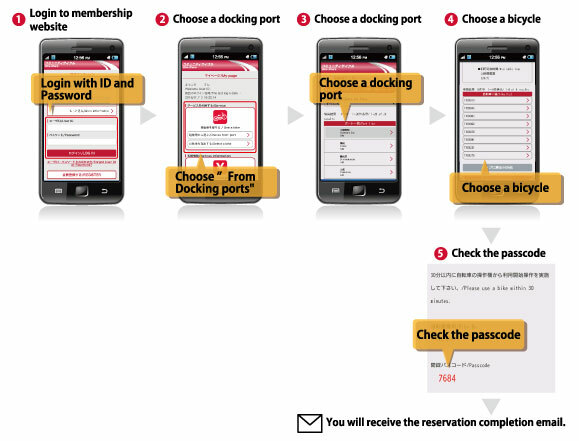 ②Push "One Trip Membership" button. 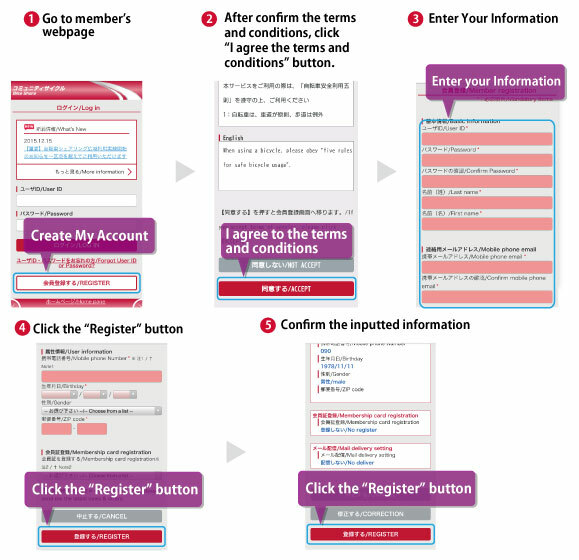 ①You can register for membership by PC or Mobile phone. 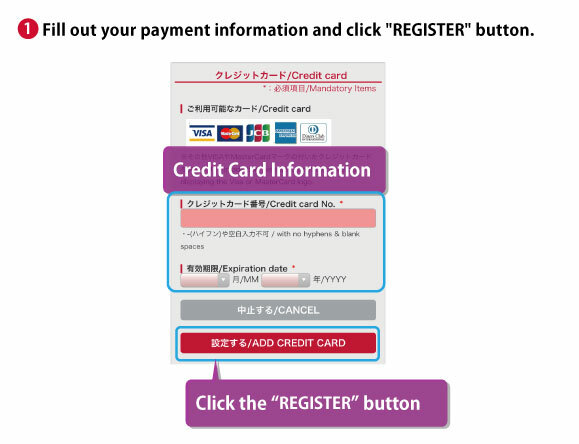 ②Fill out your payment information and the registration process will be finished. 1. Get a passcode each time you rent a bicycle. 2. Register membership card(Felica) and use it easily just by placing the card on a device of a bicycle when you rent it. Rent a bicycle by issuing an unlocking passcode. 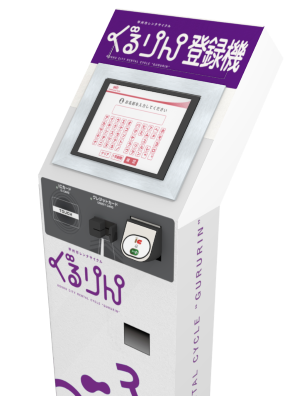 ①Rent a bicycle by issuing an unlocking passcode. ②Next, push the “start” button and enter the passcode on the device of the bicycle. 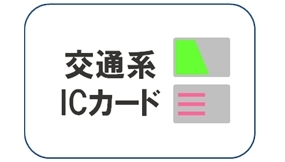 ②Register　your　own　Felica　Card. ③Push the ”START” button and then touch your Felica card on the Felica reader. ①Park your bicycle at the designated docking station, lock the bicycle by your hand. ②Next, push the “ENTER” button on the device of a bicycle. ※Every docking station is equipped with special device which can identify bicycles. Even if all docking rucks are full when you return a bicycle, it is okay to park it near the station as the return will be automatically identified. ①Park a bicycle, just lock the key. Copyright © Koshu-city All Rights Reserved.